Swell is an interesting word. It has horrific overtones in the context of a ballooning body but carries a happier sense as a response to a questioning greeting like: “How are things going?” In the context of an ocean, the word holds both senses: the swaying swell that favours the board rider as it approaches land, and the severe swell that causes loss at sea. 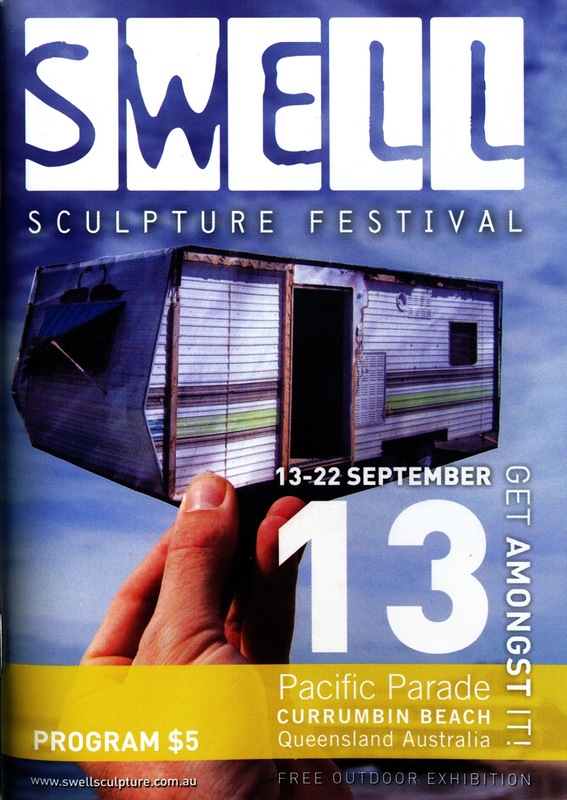 That the word should be used as a name for a sculpture festival is interesting, but here the context is predetermined: it is by the sea. 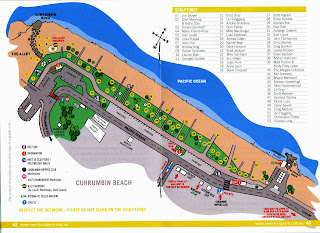 The sunny beaches, blue sky and splashing waves at Currumbin on the Gold Coast in Queensland, Australia create the ambiance for things pleasurable: for swell outcomes beside the enjoyable swells of surf and creek under a broad open sky and fresh breezes. 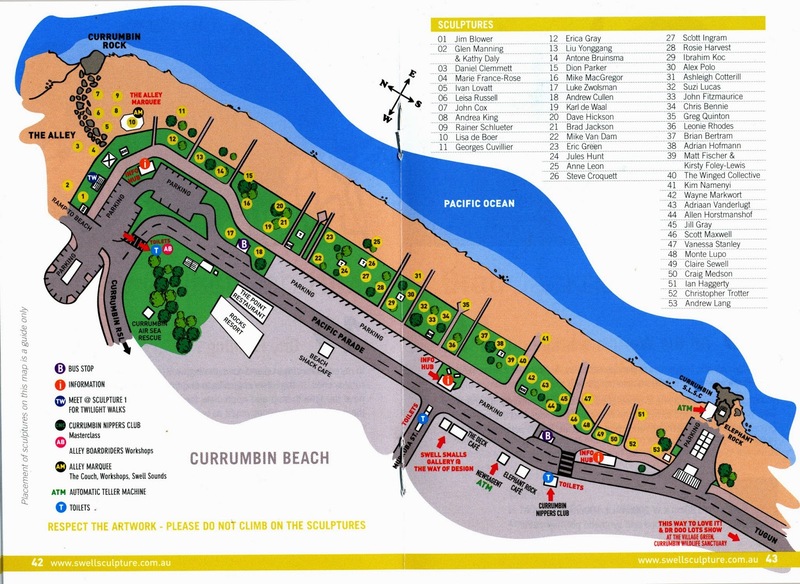 Following the idea of Bondi’s Sculpture by the Sea, the Gold Coast has created its own festival of sculptures along the beach from Currumbin Creek to Elephant Rock. 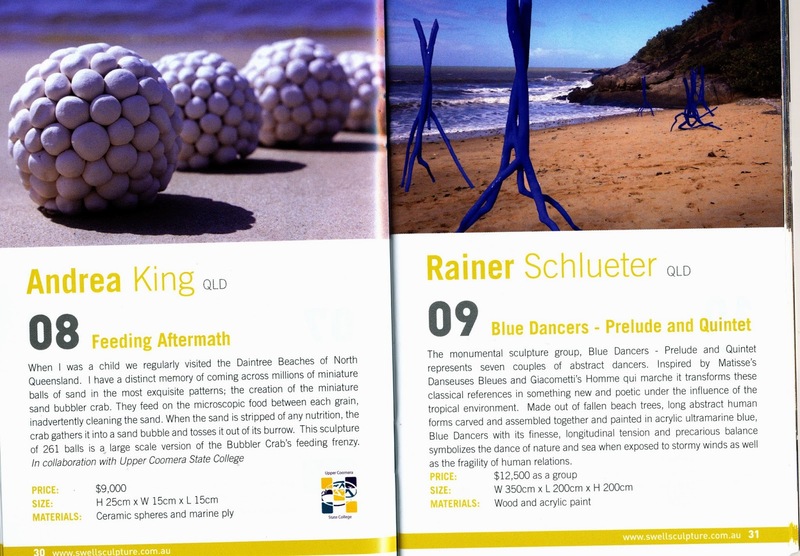 This year, 2013, there were fifty-three sculptures installed along the length of this sandy spit and grassy promenade. The stroll along the ocean esplanade was interesting. Without a catalogue offering any informing guidance, one never knew what was coming up. The small catalogue was nicely produced, compact, and carried more information than was available on the plaques near each work, but the first walk through without this pocket publication was enjoyable. The eye, mind and body were unfettered, completely at ease. All preconceptions could be put aside. One became the proverbial blank page. The return walk with the booklet was of equal interest as one could seek answers to questions posed during the initial meandering, and learn more about the works and the uninformed primary responses to them. The scope of sculptures on display covered nearly all possibilities. The range of subjects caused one to ponder: they all seemed to lack matters broad and universal. Each was individual and separate, quirkily different: narrow in range. 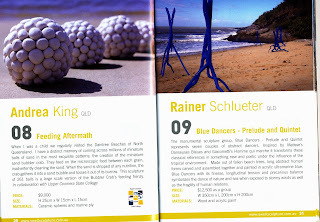 Nearly every work related to the artist’s personal experience, concepts, interpretations, expectations and perceptions. Was this display merely a challenge to highlight differences? Some works were so obscure that they became more of a cryptic puzzle than an artwork, distracting one with awkward, questioning diversions. There was no common theme other than some private involvement, where the artist was engrossed in his/her own thoughts, ideas and experience. 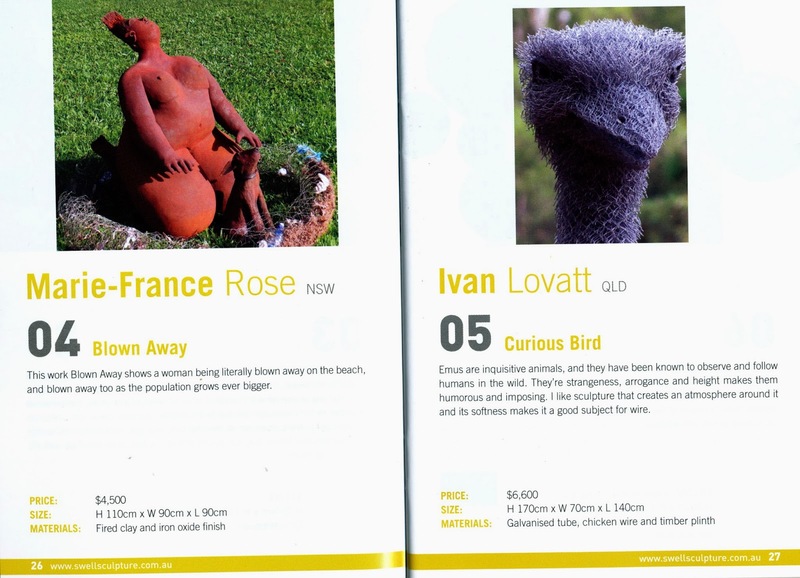 While the vista along the promenade juxtaposed the sculptures in interesting, visual layers, each work stood silently alone, encapsulating its own internal efforts to embody an interpretation of meaning. No work referenced any other; only a few recognised the special context. It was a display of intimate interiors. Consider the work that looks like a stone pelican, (or is it a stork? - in Australia? - does it matter? 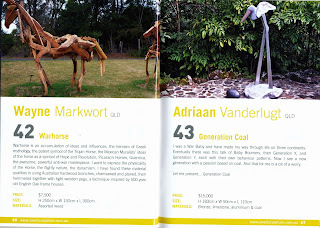 ), on high legs with an egg nearby: work number 43 by Adriaan (sic) Vanderlugt called Generation Coal. 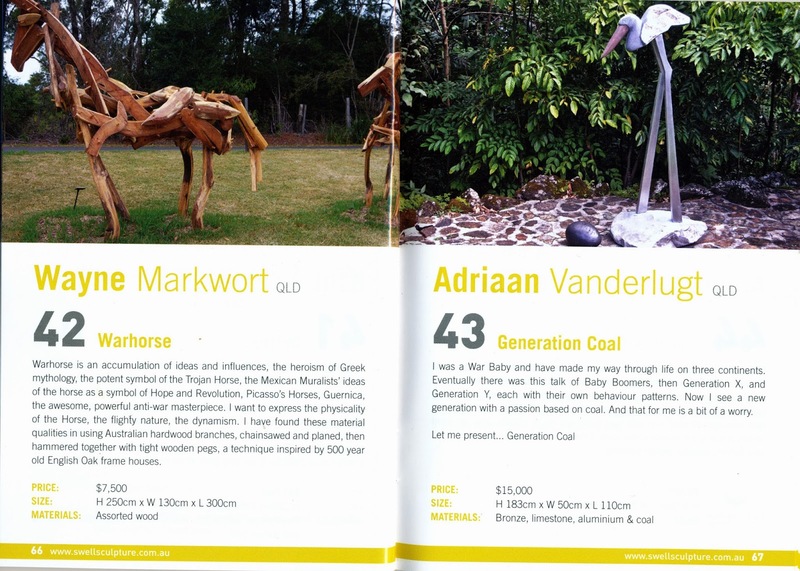 It must have some meaning for Adriaan, like the spelling of his name, but how the Baby Boomers are followed by Generation X and Generation Y, that are in turn followed by ‘Generation Coal’ remains an enigma with a meaning that one can only guess at. Just what all this has to do with a pelican or a stork on extra long legs near an egg is anyone’s guess. The work is so distractingly random and personal that it becomes quixotic, distorting the aesthetic possibilities and mocking the skill of the craft. This emotional confusion is a common feature in many works. Has art become just too much about ‘me’ and ‘my’? Do we have any shared experience other than some reflective indulgence that can become a core for ‘discovery’ and ‘expression’ in art? Traditional art was rooted in its search for meaning where difference and diversity were irrelevant as an aim in works that used the same ideas, materials and techniques to encompass values that enriched. There seems to be nothing like this today, just a scattering of personal ideas, thoughts and ponderings that have become linked to an object or have been annexed to some form of form. 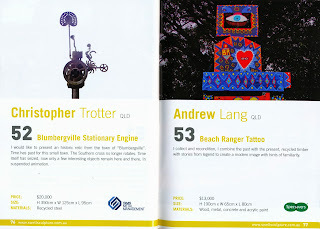 Take number 53 by Andrew Lang called Beach Ranger Tattoo. Now, without reading the text, one sees a Nolan Ned Kelly form painted in bright colours and patterns like a Pakistani cab. It is very pretty, but as an outcome arising from the text, it is merely enigmatic: ‘I collect and recondition. 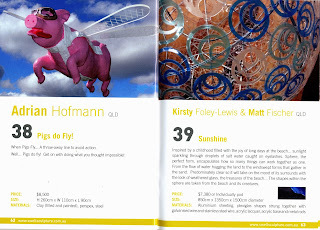 I combine the past with the present, recycled timber with stories from legend to create a modern image with hints of familiarity.’ This jumbling of words and ideas about ‘ME!’ and ‘MY’ occurs frequently, as if art arises from some revelatory confusion and self-interest, as if it was true that the more enigmatic the experience, the better the art: the more personally intimate, the greater the meaning. This is a strange alignment that seems to liken the mystery of inexplicable experience to matters that are puzzling, vague and incomprehensible, as if the creation of things formless and fuzzy will necessarily touch unknown issues of rich quality and meaning. Alas, it turns out that things uncertain and perplexing generate only more confusion and bewilderment. In the end, the meaning of mystery and the mystery of meaning may be unclear and untouchable, but they are never inarticulate or chaotic. Sadly number 52, Christopher Trotter’s work, Blumbergville Stationary Engine, lacks the energy, character, concentration and coherence that his earlier works have in abundance. Here an old Southern Cross pump is mounted on a nice stand with a few sundry additions, and has been called ‘art.’ Is the artist trying to break away from his skillful anthropomorphic images that the art world considers, (wrongly), to be just too trite? Trotter’s kangaroos in George Street Brisbane, for example, show his skill at selecting and positioning identifiable junk to create life forms with a surprising inner energy arising with the disbelief of contingency. It is a technique that, in the hands of other less skillful artists, so easily become the crass ‘Quixote’ cliché assemblages that ask one to read more into a metal mess than is ever there. I can understand the enthusiasm for these wonderful old engines that were the reliable workhorses of the outback. They are, like their windmill cousins, Australian classics. I can recall a journey around a property many years ago when the task was to fill the tanks of the pumps with petrol, crank start the motor, and then leave it to unfailingly pump water until it ran out of fuel. Attaching a pretty phoenix-like bird on a wheel, and a tractor seat on a pole to this old pump is not art. It looks like a struggle to grasp meaning through just too much fact and an indulgent surplus of misguided nostalgia. 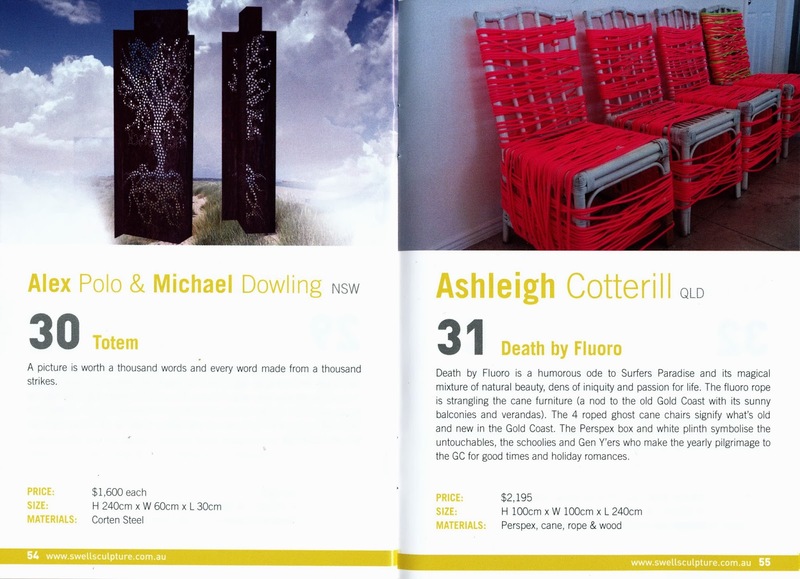 Flicking through the catalogue list backwards, as we seem to have started to do, we get the schedule below. Sundry comments have been added on each work as a quick overview. What is interesting in this transcription is the psychological twist in most of the works and the oddity of the title. It almost seems that there is a need for a ‘clever’ title for any work, irrespective of any relationship with the reality of the experience of the sculpture. Much the same can be said of the ‘explanatory’ texts where one can sometimes assume the intent has been to create a self-conscious schism to stimulate any response with a surprise or a puzzle, rather than to merely make things too ‘relaxed and comfortable.’ Some of these words appear to be irrelevant or just garbled nonsense. Why does art seem to demand some exotic rationalisation that takes issues to extremes of pretentiousness? Why are we frequently asked to make sense of such inarticulate statements? As for the psychological matters, this only highlights the core personal side of the concepts that sometimes seem to intrude or impose too much. There are no great ideas being worked on here; no common, communal understandings being explored. The critical issues seem to be that the work must be decorative, uniquely interesting and different, like the words themselves. There is not much that is transformative here. 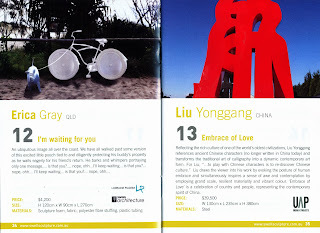 The works merely distract both the eye and the mind; such are the quirky twists on themes that have been entertained. Indeed, some sense of entertainment appears to be the basis of the intent in most works. The sculptures remove one from the everyday, for a short time, and create an odd expectation in how one looks at things. Is that rock an artwork or landscape? Is the lifesaver’s tower lying on its side part of the exhibit? Are the people viewing the works part of the show, for they do become an integral accessory to the whole, a part of the spectacle? Perhaps this is one aspect of Swell that is encouraging: it stimulates ways of seeing - (now one always thinks of John Berger’s memorable title). In one aspect the exhibition can be seen as therapy, an analogy that places the pieces on the same level as the ink blots in Rorschach tests. Is this the best we can expect? Is this the state of art in Australia today? As a morning out, the visit to Currumbin was an entertaining diversion, different to the norm and hence of some interest, but as art? Our world is buzzing, spinning in a chaotic state of change that is escalating in intensity at every turn. Does art reflect this situation? 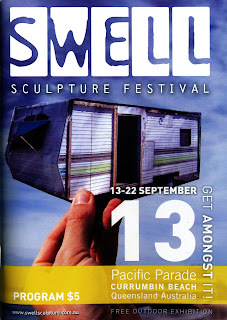 If one is to get anything positive from Swell, then it is this: that there are many ways of seeing our world. We need more tolerance, and peace and calm; more quiet, if we are to endure. Our existence would be less without such a festival of perception and ideas. Indeed, one might argue that we need more of the same, for it is only from such experimentation and challenges that matters of substance can be distilled and agreed upon, albeit unselfconsciously. One might be critical of the crude and naive attempts to touch quality and meaning, but our distracting times are not useful, and do not engender cohesion or any common sense of being. Our era is more interested in creating and marketing gadgets that can sell in the many millions, or raise that same amount in one weekend, than anything else. I am thinking of iPhones and blockbuster movies. Such an outcome needs self-centeredness for its success. ME! is the most important, me and my tats: the one and only presence in the universe to be so decorated or not - just bespoke ME! Look at ME! It is up to us to generate something richer and more substantial than this ephemeral indulgent selfishness and greed that is out of date, used, and creating discontent the very next day after the enthusiastic purchase or viewing, when the next, (always better), generation gadget or experience is being promoted, leaving ME! behind again, wanting to catch up. If Swell can help change this indulgent and irresponsible attitude to life and its living, then it will be a great success. We need to learn from such encounters and use these experiences to develop rigour and strength in our personal lives, for it is only from this distilled base that larger matters, bigger and better things, can be created. Tolerance and care are involved, and individual responsibility too. see text above: see also 30 also called Totem seemingly in the absence of any other sense. a tiny sitting figure made from pieces of pipe, a little decorative piece like Michelin man – why the pun? pottery and tiled blobs making a figure half buried in sand and foliage – why mermaid? : a rockery? a crude tube lined in mirrors in the form of a telescope to peer through; it seems that the principle of the kaleidoscope is not understood: or is it trying to suggest that ordinary life is interesting? – time machine? a Giacometti figure made from paper money (photocopied?) – why? Giacometti’s work is better. a pun on a pair (pear/twin) of breasts in a bikini that falls flat, lacking depth – we should remember that the pun is the lowest form of humour. a more serious piece in cut and partly polished stone with some red lines – meaning is difficult to capture with strength and sincerity, is spite of the ambitious intent. see text above – what does it mean? a Trojan horse made from timber scrap – an interesting piece for perception but the original Warhorse puppets are difficult to better: they move too! a giant sand castle – what is one to believe: the price? $15,000. Is this a return to things big in Australia? Why not bigger? Better? printed heads on metallic sheet placed in sand with mirror reverse – there is something too intellectual here to convince; the mirror reverse in interesting, perhaps better than the faces; certainly more intriguing. pretty spheres playing with colour, translucency and shade – sunshine? Here the sheer effort gets admired more than the experience. 38 Adrian Hofmann Pigs do Fly! a flying pink pig on a stick: with lipstick too! – what is one to think other than ‘strange’ as one recalls the American politician’s words and the old cliché? a cluster of carved timbers; the text is enigmatic – it is the dictionary definition of witness, n., . . Is one being asked to supply the content here? a small figure in a glass box framed in rusting steel on a post embodying an Aboriginal story. One can appreciate the concept by its mechanics more than the emotional experience. coloured balls in a wire mesh frame moving in the wind asks one to see the arrangement as such. It struggles to be more than this. a Hepworth wave form in mirror finish. It seems to promote a combination of 60’s clichés. lots of old DVDs on poles with eastern hookahs etc. - ? Yes, lots of DVDs. It reminds one of the roundabouts in the United Arab Emirates. four old chairs wrapped in bright pink plastic rope $2,195.00 – this tests the limits of art and the tolerance of the public as much as the caravan. Do we blame Christo for such works or Marcel Duchamp? another totem but these rusting steel screens are very pretty – nice shadows. Strangely they look much better in the photographic image than in life. a lovely chameleon but he looks lost, struggling to find home. Does this say something about all of the works? a tangle of wood and vines that suggests a figure – it keeps one guessing, seeing tangles and body forms in the shambles, but there remains a lingering dissatisfaction with the effort. scratched stone with an organic-shaped polished strip. A flower? A lot of effort is needed to make this leap. Easter Island heads in steel – why? Japanese flying fish – here $300.00 each. These are standard fare in Japan but are being promoted differently here. Why can we not accept these as beautiful traditional kites rather than a unique work of art? oddly shaped suspended metallic ceramic forms do not remind one of the distinctive leaf; or the tree - and the bird? Corbusier’s bird at Ronchamp is richer. stainless steel chain made from stainless steel chain – 750 metres of it! Craft and concept have rigour and strength, a cohesion that is admirable, as is the craft. It seems to demand a corporate location. the poor wren looks like it has a falcon hood over its head – the paper folds need closer inspection and a more sensitive resolution. Are origami forms are becoming too fashionable? The question of copyright is interesting. a roughly made assemblage like a small stage set; so? Shakespeare? do flies swarm? Attractive flies made of wire and painted black: they just are flies. One recalls Craig Fellows printed designs. a tree form covered in cut-out hands – very pretty shadows, like Aboriginal wall painting. The shadows are powerful. Is this the work? a skull in halves with coloured checkerboard interior - ?? Too literal with little magic or intrigue. What is mind? What is man, that thou art mindful of him? (Psalm 8, 4-6 KJV). flower forms in sandstone – poor Monet; poor flowers. Mass takes over form: c.f. ‘the form of the rose is the function of the rose; the function of the rose is the form of the rose’ (Louis Sullivan). 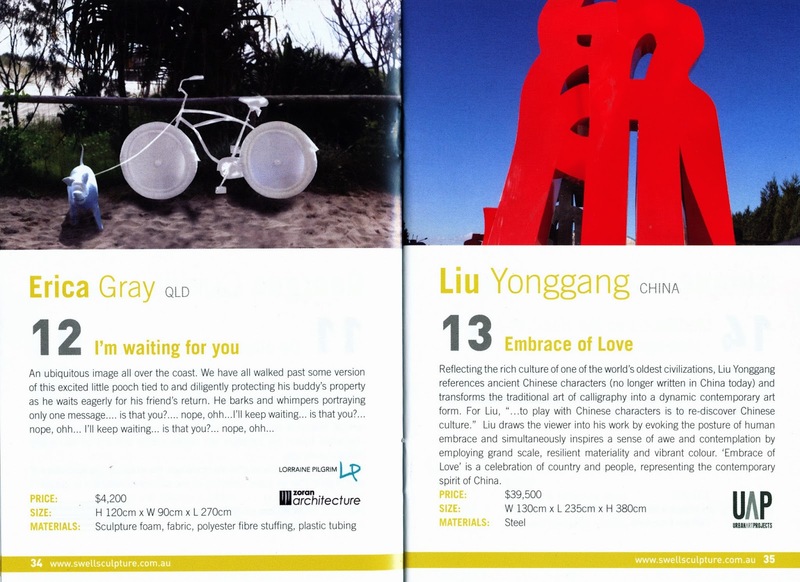 ancient Chinese characters large in steel – what does one do? Admire the size or the message? The size of the message? a bike and a dog tied to it, made from white fabric – at least it is humorous, especially when a dog goes up to in and checks things out! Art? Artful? Harvesting bamboo?? What is this? How does one look at this other than ‘interestingly’? Is the ambition: a thing of interest is a joy forever? - (apologies to Keats). Gone, broken glass – glass does not make good public art. sticks in sand painted bright blue create a challenge for the viewer, as does the price: $12,500. The blue is good. Is one to supply the substance for the idea? pretty ceramic spheres made to look like crab pellets expelled from their holes in the sand, set out in circles – thoughtful and quietly impressive: truly a beach work. plastic bikini girl with surfboard – all blue from the bikini pants up - ? Why? spheres with things stuck over them. They lack the ephemeral nature of tidal change nicely named ‘shormal’ in Shetland dialect. a marvellous emu made from galvanised wire mesh – beautiful. It has something of the early Trotter work that impresses. It feels oddly uneasy standing in the beach sand. it hardly blows one away, but the dog is good. no dogs, just a stylised, quirky house boat. More information is needed to comprehend this effort. an outline of a Henry Moore reclining figure in one bent pipe. 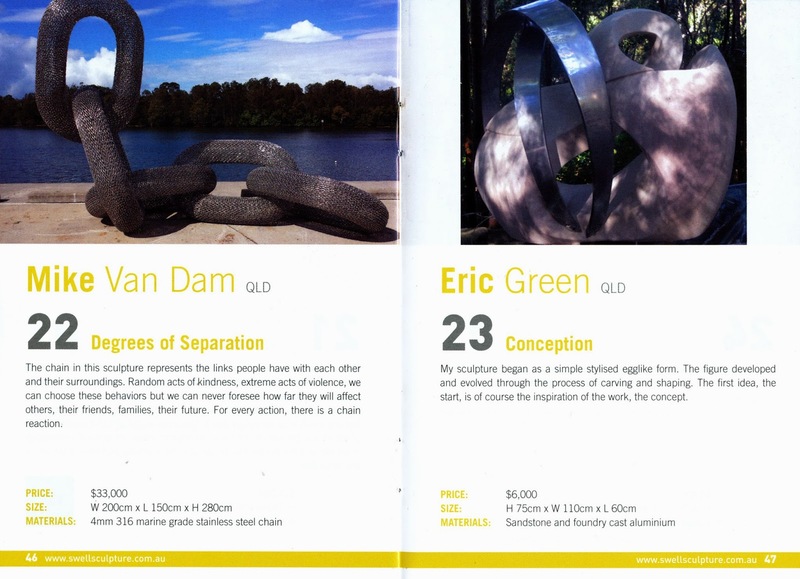 At $25,800, the price is more impressive than the work!